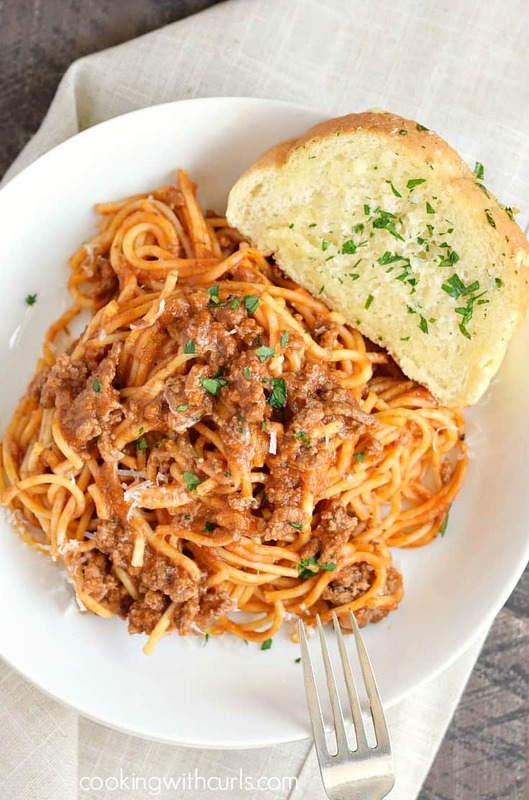 Instant Pot Spaghetti is fast and delicious, making it the perfect meal on busy nights that the whole family will love! It is also a great meal when you have major dental work done and cannot eat solid food. 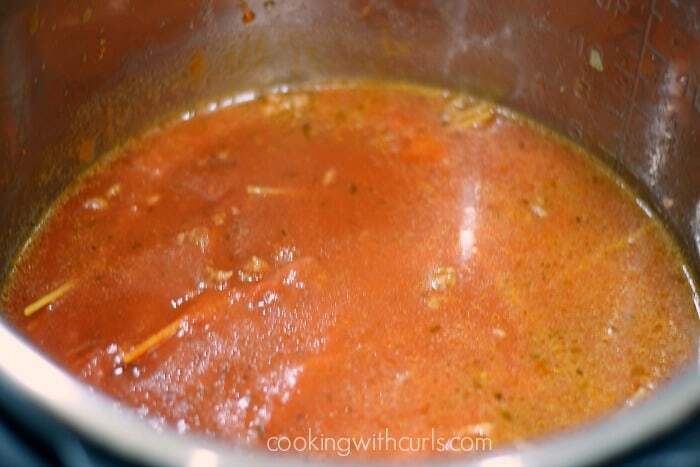 Or when the swelling from said dental work turns into a sinus infection and you need something for dinner that doesn’t require too much brain power…..
What does that have to do with Instant Pot Spaghetti? 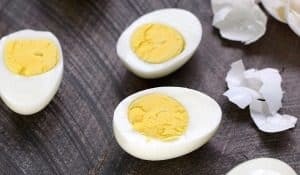 It means you are going to be seeing more recipes in the next few weeks for newbies, newlyweds, busy parents, and college students, maybe even an Instant Pot 101 post with tips and tricks for success. But for now, let’s make some Instant Pot Spaghetti!! Press the Saute button and wait for it to get HOT. 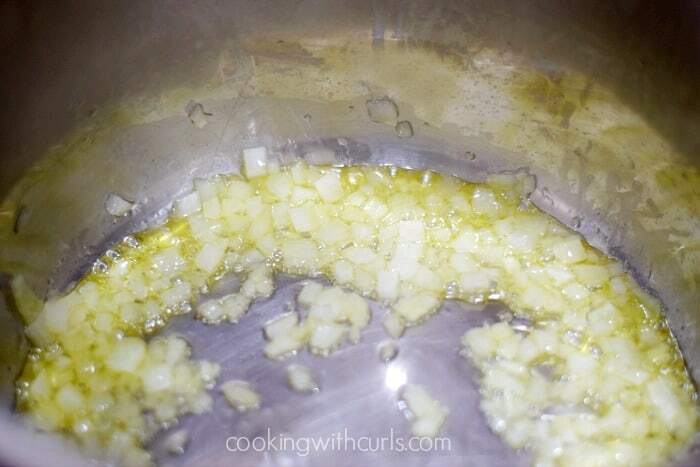 Add the oil, swirl it around, then add the onions…..
Cook until the onions start to soften. Add the garlic and stir to combine. 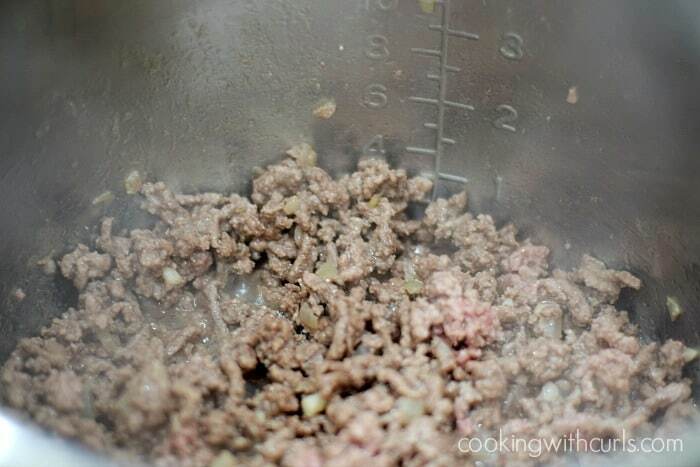 Add the ground beef/turkey and cook until most of the pink is gone…..
Press the Cancel button, then the Manual button. Add the water and scrape the bottom of the pot to make sure there are no stuck on bits that can burn. 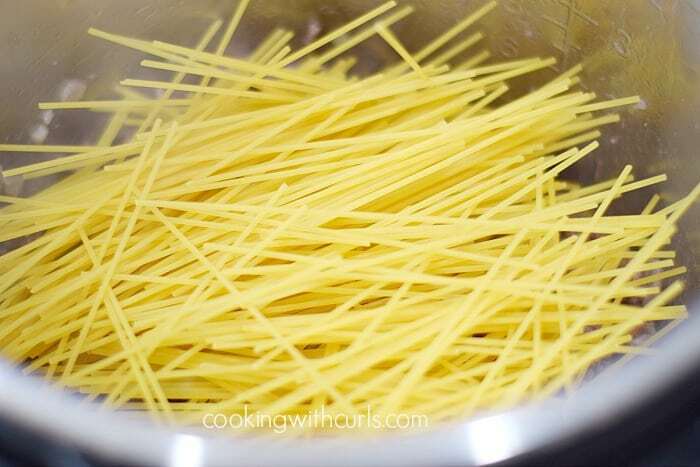 Break the spaghetti noodles in half and lay them on top of the meat…..
Pour the sauce on top of the spaghetti noodles….. 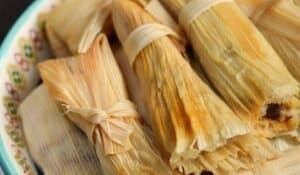 Grab a pair of tongs and carefully fold the ingredients together….. Secure the lid and make sure the knob is in the Sealing position. Press the – or + buttons and set the time for 5 minutes….. When the pot beeps, allow the pressure to release naturally for 5 minutes, then carefully release the remaining pressure. 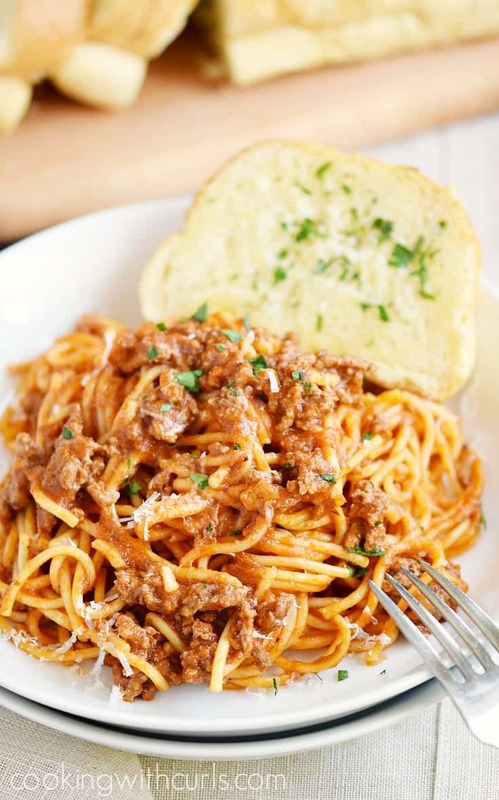 Stir everything together…..
and serve with grated Parmesan cheese and Garlic Bread. Adding the cold oil to a very hot pot helps keep the foods from sticking. For a vegan meal, omit the ground beef and continue on with the recipe. I used Prego Traditional Pasta Sauce to keep things nice and simple. 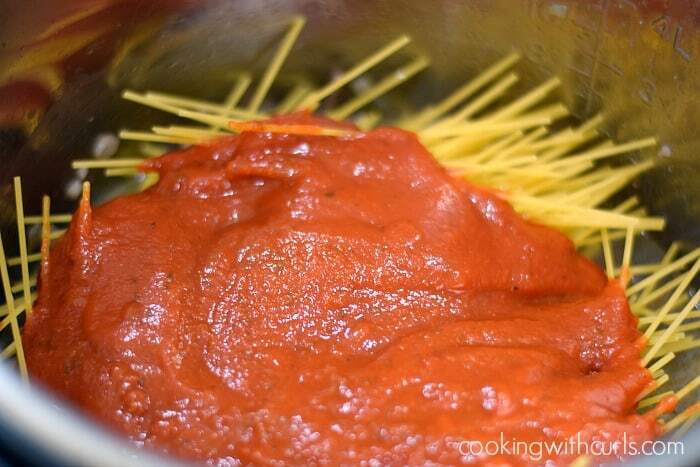 It is thinner than a Homemade Marinara Sauce so you may need to add additional water if your sauce is very thick. The noodles need the water to cook properly, so compare to the image above when in doubt. I used 97% lean, grass-fed ground beef so I would not have to drain off the fat. I used Barilla Spaghetti, the regular one not the thin or thick version. I chose 5 minutes because the cooking instructions on the box state “Al dente perfection in 9 – 10 minutes”. I must not like al dente because I always add an additional minute or two. 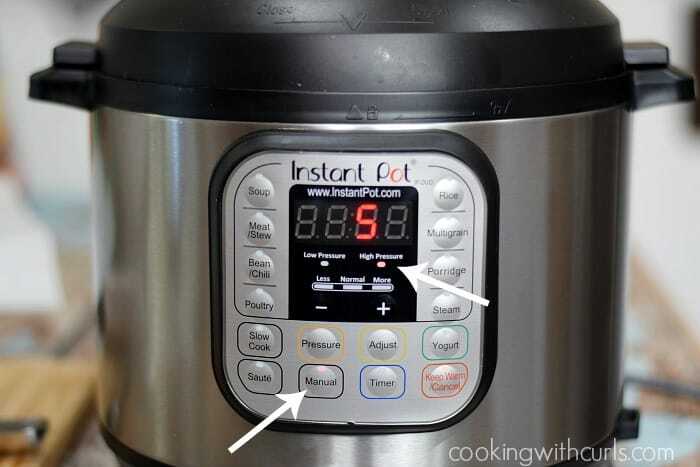 The basic formula for cooking noodles in an Instant Pot is to cook for half of the lowest time stated on the box, so 5 minutes was the winner. The noodles were cooked perfectly, the ground beef was thoroughly cooked, and the whole meal was a success…YAY!!! 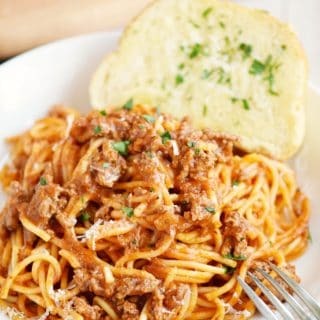 Instant Pot Spaghetti is fast and delicious, making it the perfect meal on busy nights that the whole family will love! Pres the Saute button and wait for it to get HOT. Add the oil, swirl it around, then add the onions. Cook until the onions start to soften. Add the garlic and stir to combine. Add the ground beef/turkey and cook until most of the pink is gone. 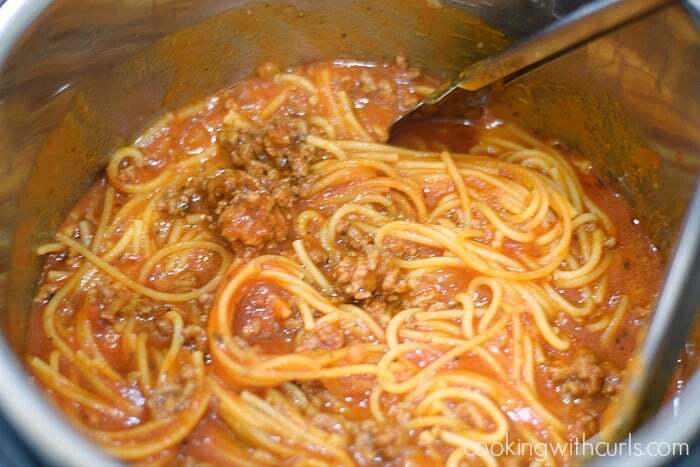 Break the spaghetti noodles in half and lay them on top of the meat. Secure the lid and make sure the knob is in the Sealing position. Press the – or + buttons and set the time for 5 minutes. Gave my daughter an instant pot for her birthday so will forward this to her. 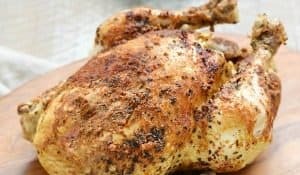 She avoids red meat for medical reasons, so I am always hunting recipes that can use turkey or chicken! I made this last night and it was great. I did add chopped olives. Fast, easy, delicious after working all day. The Instant Pot is my roommate’s and I don’t think she’s used it more than once. I on the other hand, am using it constantly – she’s free to move out but the pot stays! In the final step, are you supposed to set it to ‘manual’ and then for 5 minutes or by set it at all and set for 5 min? It didn’t say and I don’t want to do it wrong. Thanks! Yes, push the Manual button and adjust the “time” to 5 minutes. Sorry about that, I will go remove the “r”. Thanks so much for pointing that out, Lindsay! Would the time be different if I don’t use any meat?